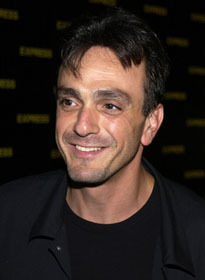 Trained as a stage actor, Hank Azaria performed in several serious plays before moving to Los Angeles to try his hand at stand-up comedy. Before The Simpsons he had an almost empty film and television résumé, and earned his living mostly as a bartender. On The Simpsons, Azaria gives voice to Moe the bartender, Apu the Kwik-E-Mart owner, Police Chief Wiggum, Professor Frink, Dr. Nick Riviera, Comic Book Guy, Superintendent Chalmers, Disco Stu, the gap-toothed Cletus, Snake the recidivist, and several other citizens of Springfield. Since The Simpsons started, Azaria has become a familiar character actor. His other TV series include Herman's Head, If Not For You, Mad About You, Imagine That, and Huff!. In movies, he played a cop in Pretty Woman and Grosse Pointe Blank, the producer of a rigged Quiz Show, the silverware-wielding superhero Blue Raja in Mystery Men, and the pre-crotchety coach in Dodgeball. He took Robert Downey, Jr.'s role in America's Sweethearts after one of Downey's many drug-related arrests. Azaria says his "Moe the bartender" voice is based on a bad impression of Al Pacino.